Be the first to share your favorite memory, photo or story of Esther. This memorial page is dedicated for family, friends and future generations to celebrate the life of their loved one. 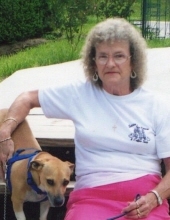 Esther Burnett Landrum, 75, of 1380 Orphanage Road, Danville, Va., passed away on Thursday, February 7, 2019, at her residence. She was born July 7, 1943, daughter of the late Nannie Lou Walker Adams and the late Dudley Rice. She was also preceded in death by her husband, Lewis C. Landrum. Mrs. Landrum retired from Dan River Inc. following 47 years of service and after retirement was employed at Skatetown USA. During her time in Florida, she was a member of the Shuffleboard Club and the Bluegrass Association. Mrs. Landrum was of the Baptist Faith. Mrs. Landrum is survived by her daughter, Judy B. Mayhew of Danville; her sons, James R. Mayhew, Jr. and wife, Kristen of Blairs, Va. and Clinton J. Burnett and wife, Melissa of Danville; her grandchildren, Ashley Mayhew and fiancé, Cody Adkins, and Emily and James Carroll; her great-grandchildren, Cole Carter, Caiden and Abel Adkins, and Makenzye Mayhew; as well as numerous brothers and sisters. In addition to her husband and parents, Mrs. Landrum was predeceased by her son, Lonnie Burnett; her special friend, Glen Howerton; numerous brothers and sisters; and her special pets, Willie and Toby “Little Boy”. Funeral services will be held at 2 p.m. Monday, February 11, 2019, at Norris Mt. Hermon Chapel with Rev. Daryl Joyce officiating. Interment will follow at Danville Memorial Gardens. The family will receive friends from 5 p.m. to 6:30 p.m. Sunday, February 10, 2019, at Norris Mt. Hermon Chapel, and at other times at the residence, 1380 Orphanage Rd., Danville. The family respectfully requests memorial donations be made to the Disabled American Veterans, P.O. Box 14301, Cincinnati, OH 45250-0301 (www.dav.org). Norris Funeral Services, Inc. & Crematory, Mt. Hermon Chapel, 3995 Franklin Tpke., Danville, Va. is respectfully serving the Landrum family. Online condolences may be made at www.norrisfuneral.com. To send flowers or a remembrance gift to the family of Esther Burnett Landrum, please visit our Tribute Store. "Email Address" would like to share the life celebration of Esther Burnett Landrum. Click on the "link" to go to share a favorite memory or leave a condolence message for the family.